The new generation of Titration Excellence combines all benefits of its predecessors with exciting new features, such as automated sodium determination, coulometric Karl Fischer titration and an integrated SmartSample™ reader. Thanks to the unique modularity, Titration Excellence can be optimally configured and adapted to existing as well as future requirements. This truly powerful titration system meets regulatory compliance and is tailored exactly to customers' needs. Efficient sodium determination – The standard addition technique for sodium determination is an essential part of the new Titration Excellence line. The fully-automated direct sodium determination allows analysis of an entire sample series, saving time and increasing daily analysis throughput. Even sample preparation can be automated using additional dosing units and a homogenizer. 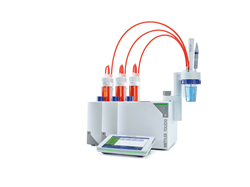 Expanded range of water content determination – The modularity of Titration Excellence now enables coulometric Karl Fischer titration to be performed on all instruments. The feature allows analysis of water content down to 1ppm. This new coulometric option also improves Bromine Index determination due to the availability of low current generation. This integrated option requires no additional device or bench space, matching the lean laboratory philosophy. Error-free titration workflow – With the integrated SmartSample reader on all Titration Excellence instruments, wireless data transfer from balance to titrator is now possible on single samples, eliminating transcription errors and mix-ups. The SmartSample solution is therefore an intelligent choice for both single- and automated multi-sample titration. Through the intuitive and easy-to-understand One Click® user interface, Titration Excellence offers configuring of user specific settings to ensure a safe and simple operation. This truly powerful titration system meets regulatory compliance and is tailored exactly to customers' needs. Find out more on http://www.mt.com/Titration-Excellence or contact your local sales representative for more information. METTLER TOLEDO is a leading global supplier of precision instruments and services. The Company is the world’s largest manufacturer and marketer of weighing instruments for use in laboratory, industrial and food retailing applications. METTLER TOLEDO also holds top-three market positions in several related analytical instruments and is a leading provider of automated chemistry systems used in drug and chemical compound discovery and development. In addition, the Company is the world’s largest manufacturer and marketer of metal detection and other end-of-line inspection systems used in production and packaging and holds a leading position in certain process analytics applications. Additional information about METTLER TOLEDO can be found at http://www.mt.com.